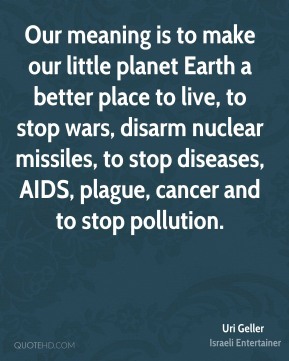 Our meaning is to make our little planet Earth a better place to live, to stop wars, disarm nuclear missiles, to stop diseases, AIDS, plague, cancer and to stop pollution. 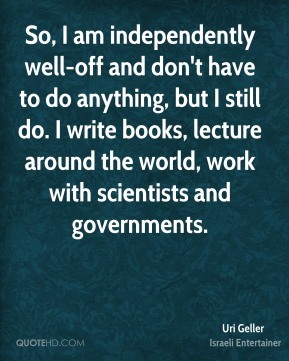 So, I am independently well-off and don't have to do anything, but I still do. I write books, lecture around the world, work with scientists and governments. The best part of being a vegan is the purity and peace of mind one experiences and the strong connection I feel to the animal kingdom. I believe in past lives but I know nothing about mine and I don't want to know. 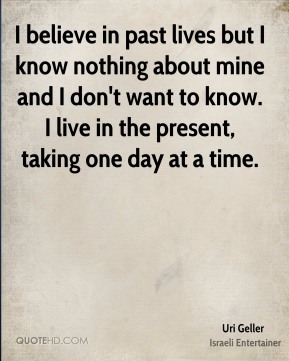 I live in the present, taking one day at a time. I think I usually have quite ordinary dreams. Sometimes my dreams take me to other dimensions. I can travel in my mind especially when I'm dreaming I focus my mind on what I want to dream. 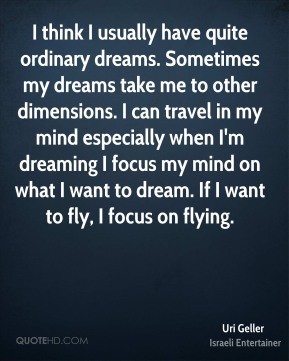 If I want to fly, I focus on flying. 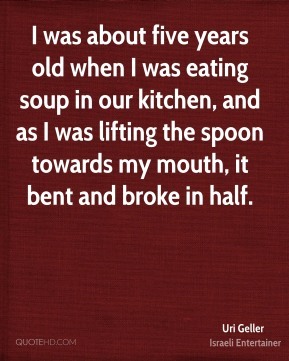 I was about five years old when I was eating soup in our kitchen, and as I was lifting the spoon towards my mouth, it bent and broke in half. 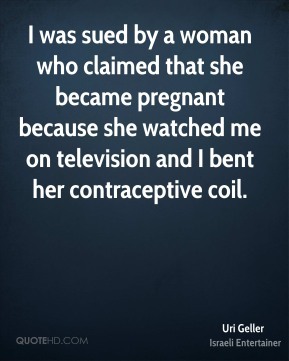 I was sued by a woman who claimed that she became pregnant because she watched me on television and I bent her contraceptive coil. I'm a religious man. 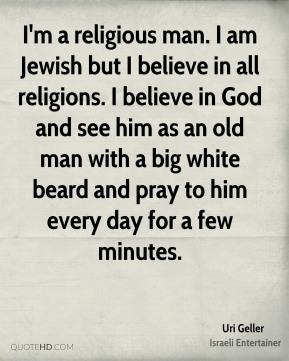 I am Jewish but I believe in all religions. I believe in God and see him as an old man with a big white beard and pray to him every day for a few minutes. 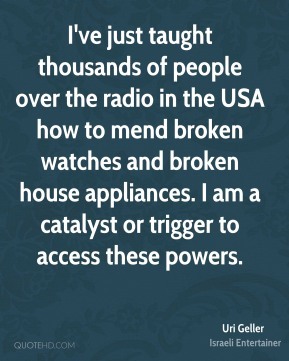 I've just taught thousands of people over the radio in the USA how to mend broken watches and broken house appliances. I am a catalyst or trigger to access these powers. 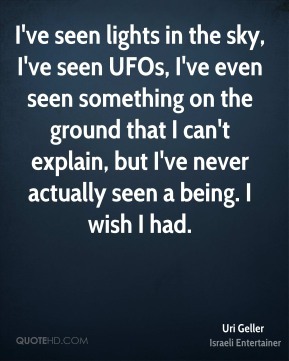 I've seen lights in the sky, I've seen UFOs, I've even seen something on the ground that I can't explain, but I've never actually seen a being. I wish I had. I've stopped caring about skeptics, but if they libel or defame me they will end up in court. 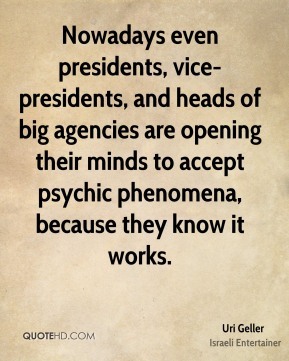 Nowadays even presidents, vice-presidents, and heads of big agencies are opening their minds to accept psychic phenomena, because they know it works.